Hello lovely ladies≥nts! Here is my 16th look! A metallic gold/brown look for a day with my friend! I used my Accessorize palette for this look. 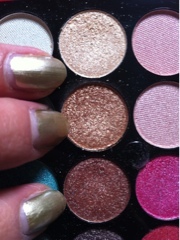 I used a metallic gold shade for my base and then a metallic brown shade for my crease and edge. My focus colour is the brown! 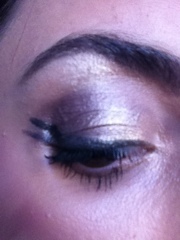 Its a smokey metallic brown that adds a sultry sparkle to any look. 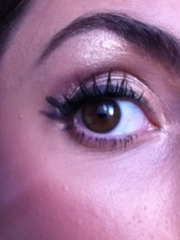 For a highlighter below my brow I used a lighter gold shade. Finished with mascara and a two flick liner! Like this look? Hope so. Looks lovely, hun!! I can't believe you're at number 16 already! !